"I hope we’ve seen the last of the rain. My wings can’t take much more," Bonnie complained. "This is a lovely area. Where are we now, Bruce?" "We’re flying over Perthshire now. Say, there’s a lovely little town called Comrie, not too far from here. They have a lot of flowers there. I was here once before, long ago. Are you feeling peckish?" Bruce asked. "I’m quite hungry. I could go with a few sips of nectar. Lovely flowers, lovely town; I say we head there," Bonnie answered. The butterflies fluttered their wings and headed towards Comrie. "Bonnie, the Romans used to call Comrie, Victoria. It also has a nickname, Shaky Toun," he chuckled. "Shaky Toun? Whatever for?" Bonnie asked. "You’ll find out. Oh good, there’s the mountains and there’s Melville Monument," Bruce pointed out. "What’s Melville Monument, may I ask?" "It’s built on Dunmore Peak. I think it was built in the early 1800’s…1811, I believe," Bruce said. "Who is Melville? Hermann Melville?" Bonnie asked. "No, don’t be silly. It was built to commemorate the first lord of Melville, Henry Dundas. It was struck by lightning once." "What a view. This is grand. I can see all the way to Edinburgh from here," Bonnie said, surprised. "There’s Comrie down there, right?" They looked that way. "Yes, Bonnie. That’s it. Before we head there though, would you like to see a waterfall?" "It’s called Deil’s Cauldron or the Devil’s Kettle. There’s a legend that says that a water elf named Uris-Chidh lives there and he’s very mischievous," Bruce said. "I don’t want to go there then. Let’s look at it from above. I don’t like water elves," Bonnie said fearfully. "All right, we’ll watch from above. There it is," Bruce said, showing her the falls. A roaring sound came from below as the water cascaded and plunged downwards. "Pretty, and look at all the spray and mist," Bonnie said. "I’m nervous. I don’t want Uris-Chidh to get us. Let’s go to Comrie right now." They flew off. "The water elf wouldn’t have gotten you, Bonnie. It’s just a legend," Bruce chided. Comrie was a quiet town. 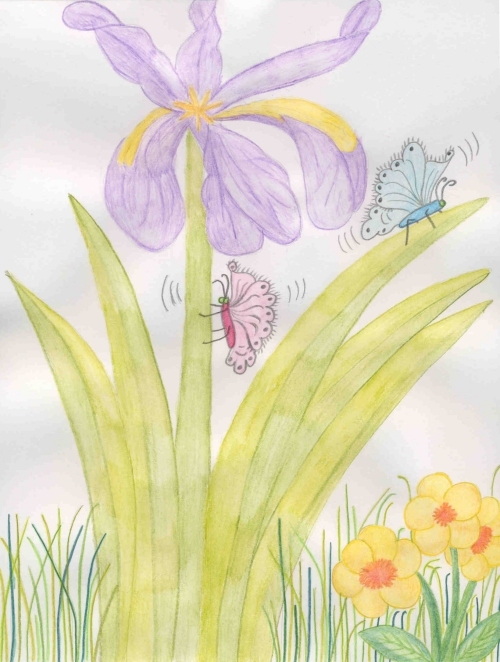 They landed in a garden filled with primroses, lady slippers and iris. Bonnie began to sip the nectar. Bruce sat on an iris leaf, looking around. Suddenly the ground began to shake, rumble and sway. "What’s happening? The ground is shaking? Help?" Bonnie cried as she held onto a stem so she wouldn’t fall. "Help!" She was very afraid. After about a minute, the ground stop shaking. "Remember how I told you one of the nicknames for Comrie was Shaky Toun? That’s why. It sits on a fault and there are many many small earthquakes," Bruce explained. "Earthquakes? Water elves? What are you doing to me, Bruce, bringing me to a place like this?" Bonnie squealed. "Relax, it’s a lovely town, as you said. Come on, let’s finish eating and look around. You’ll see, it’s safe." The butterflies fluttered around. They saw lochs and rivers, people hunting, birds of all kinds, foxes, raccoons and deer. "This is nice, Bruce. Thanks for bringing me here," Bonnie said. Comrie was a wonderful day for the butterflies. They flew off, heading north, happy that they were getting to visit such wonderful towns in Scotland. Learn more about Comrie here!